The California Chaparral Institute is a non-profit organization for the research and conservation of chaparral habitats in California. It is based in Escondido, Southern California. It is composed of naturalists, scientists, wildland firefighters, and educators who value the chaparral as both a valuable resource and a place to enjoy the wilderness. It was founded by Richard Halsey and aims to protect the California chaparral ecosystem through public education and legal action. In particular, based on fire ecology, the research group is known for opposing the clearing of native trees and shrubs from natural areas, and to require an environmental review of any such habitat destruction proposals before their implementation. They have also lobbied for more funding and more staffing for fighting wildfires. In June 2010 the group filed suit against an "emergency" plant clearing project by San Diego County, and a San Diego Superior Court judge agreed that the county should conduct an environmental review first. The group has also objected to similar plans by the U.S. Forest Service to trim or remove native plants in the Cleveland National Forest and the Los Padres National Forest. They argue that removing chaparral, through clearance or controlled burns, promotes the invasive growth of non-native plants which are even more of a fire hazard. They have expressed concern that the combination of brush clearance and massive wildfires could eliminate most California chaparral within a century. In April 2010 they came to the defense of a person who was threatened with losing his home over his refusal to clear weeds and brush from his property. They have proposed, unsuccessfully, that residential building be prohibited in the most fire-prone areas. 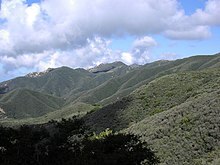 The California chaparral and woodlands ecoregion is in the Mediterranean forests, woodlands, and scrub biome. It is one of the biome's only five Mediterranean chaparral ecoregions in the world. ^ a b Davis, Kristina. "Firefighter study urges 4 per engine". San Diego Union Tribune. Retrieved 2 October 2012. ^ Joyce, Ed (July 8, 2009). "Group Sues San Diego County Over Fire Protection Project". KPBS. Retrieved 2 October 2012. ^ Lee, Mike (February 27, 2010). "Brush-clearing for fire safety faces a battle". San Diego Union Tribune. Retrieved 2 October 2012. ^ Joyce, Ed (March 5, 2010). "Court Puts San Diego County Backcountry Tree Removal Plan On Hold". KPBS. Retrieved 2 October 2012. ^ Joyce, Ed (April 1, 2010). "Group Questions Plan To Remove Chapparal [sic] In Cleveland National Forest". KPBS. Retrieved 2 October 2012. ^ Preston, Ben (December 23, 2009). "Forest Service Under Fire; Environmental Groups Sue Over Prescribed Burns". Santa Barbara Independent. Retrieved 2 October 2012. ^ Mieszkowski, Katharine (October 27, 2007). "The Burning Question". Salon. Retrieved 2 October 2012. ^ Downey, Dave (November 13, 2007). "One-two punch could knock out chaparral". North County Times. Retrieved 2 October 2012. ^ Krueger, Anne (April 13, 2010). "As Dehesa's unique art house faces seizure, a defense rallies". San Diego Union Tribune. Retrieved 2 October 2012. ^ Mishak, Michael J. (July 18, 2011). "Gov. Jerry Brown, Legislature require rural homeowners to pay fire fee". Los Angeles Times. Retrieved 2 October 2012. This page was last edited on 29 November 2018, at 02:59 (UTC).